This summer, one of UCCS’ largest construction projects made significant progress. On June 13, the University of Colorado Board of Regents approved $61 million to go toward building the William J. Hybl Sports Medicine and Performance Center, which will host a variety of degree programs, including exercise science, clinical services and serve as a tourist spot for Colorado Springs. Construction for the 104,000 square foot building, named in honor of William J. Hybl, the El Pomar Foundation chairman, will begin in July 2018. The center is projected to be completed in December 2019. Senior health and wellness promotion major Brittany Mcquown is excited about the opportunities the center will provide. “As somebody who is part of the Health Sciences Department, I think it is amazing that students will be able to gain so much hands-on experience before they even graduate,” said Mcquown. The building is a joint venture between UCCS and Penrose St. Francis Health Services. The partnership will provide a clinical training setting for students, making UCCS one of the few schools in the country where undergraduate and graduate students can participate in a clinical setting. Penrose St. Francis will be responsible for the clinical aspect of the building, focusing on orthopedics, physical therapy and primary care centered around sports medicine. The building will also have state-of-the-art technology, including X-ray and MRI imaging and DXA, imaging technology that measures bone density. Carolyn Fox, executive director of Construction and Planning, believes this opportunity will be beneficial to students. “This is really unique, especially at the undergraduate level for students to get the opportunity to actually get hands-on experience in their field, so students with degrees in sports medicine will have the opportunity to actually work with patients,” said Fox. Fox said that the new building won’t just attract new students, but a wide array of qualified faculty as well. “The faculty here have been working with Olympians, and college and professional athletes,” she said. Jackie Berning, professor and chair of Health Sciences, explained that the center will not exclusively serve professional athletes, but those who simply live an active lifestyle as well. Although students are excited about the new addition to campus, there are concerns that the influx of new students who come to UCCS for the center could put a strain on campus space. “Parking and housing at UCCS is already cramped and bringing in so many new students could cause it to be even worse,” said Ariana Borders, a senior criminal justice major. There are also concerns regarding where the Health Sciences Department will be located. Currently, the department is spread out across campus in University Hall and the Lane Center for Academic Health Sciences. 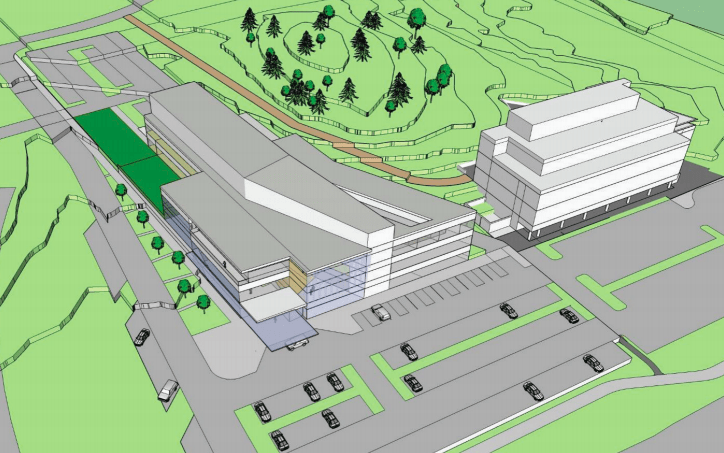 The addition of the Sports Medicine Center would spread the department across a third building. But Berning hopes the addition of the Sports Medicine and Performance Center and eventually an entire Health and Wellness Village will allow the department to be consolidated in one area. “We are trying to work out how we can all come together, because it is kind of funky to have a department spread across three different buildings,” she said. The new center will be be broken up into three divisions: the Center for Tactical and Occupational Performance, the Center for Athletes and Active Individuals with Physical Disabilities and the Environmental Health and Performance Center. The Center for Tactical and Occupational Performance will treat occupational athletes, including firemen and policemen. The Center for Athletes and Active Individuals with Physical Disabilities will treat those with a wide range of physical impairments including Paralympians and those with chronic diseases. The environmental Health and Performance Center will examine and treat people who need to adjust their physiology to changes in environment. For more information on the William J. Hybl Sports Medicine and Performance Center, visit uccs.edu/facsrvs/projects-in-design/sports-medicine-and-performance-center-(william-j-hybl).